2013 Aranwa Reserve Cabernet Sauvignon, Mendoza, Argentina. The 2014 Gascon Malbec, originating from the Mendoza region of Argentina, was exactly the kick of spice and dark fruits that I wanted tonight to accompany my steak. I opted for London Broil and a side salad, and the pepper seasoning of the meat and the onions in the mixed greens needed something substantive in terms of wine pairings. The Gascon lived up to the task. 2014 Gascon Malbec, Mendoza, Argentina. This isn’t my first bottle of Gascon but first of the vintage. The Notes review of the 2009 you can read here. What of the Mendoza region? Mendoza is responsible for nearly two thirds of all Argentinian wine production. It is located in the foothills of the Andes mountains, which is one of the highest elevations for grape growing worldwide. Mendoza soil is predominantly loose sand over clay, which means less to this reviewer but is perhaps relevant to you, reader, so I include nevertheless. The region has only a few centimeters of rain all year, which means its vineyards depend on irrigation, but with four seasons and no extreme temperature swings Mendoza sounds highly conducive to grape growing. The result of all this environment? 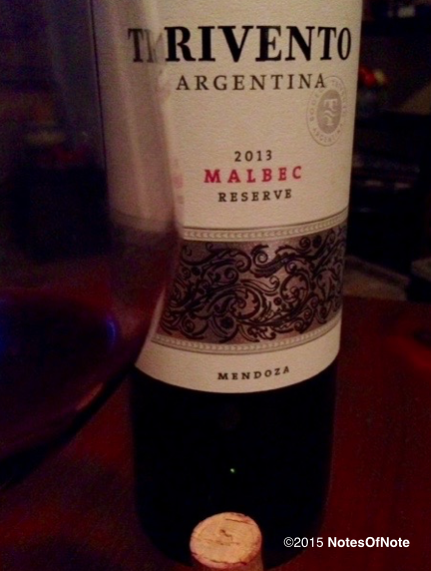 A rich, layered Malbec that has blackberry and pepper spices to offer. It pours dark and luscious in the glass, and has great aromas that I can’t quite define for you. It’s full. It’s got a really nice, even finish. The 2014 Gascon is readily available at your local grocery store or wine distributor, and it is very affordable at less than $15 per bottle. Needless to say it complemented the meal effectively. I recently enjoyed “high altitude” wine in the form of the 2005 Bodega Classica Hacienda Lopez de Haro Reserva, which is too small a sample size to know if the altitude is an influence on my tastes or merely coincidence. A good hypothesis to explore, though, right? The journey is sometimes even better than the destination. Let’s not overthink this one. This is the 2012 Pannunzio GV Giovanni Vincenzo Malbec, which I’m sipping on the patio of Tony P’s Dockside Grill in Marina Del Rey. I went out questing for the Pacific and ended up in this casual joint. 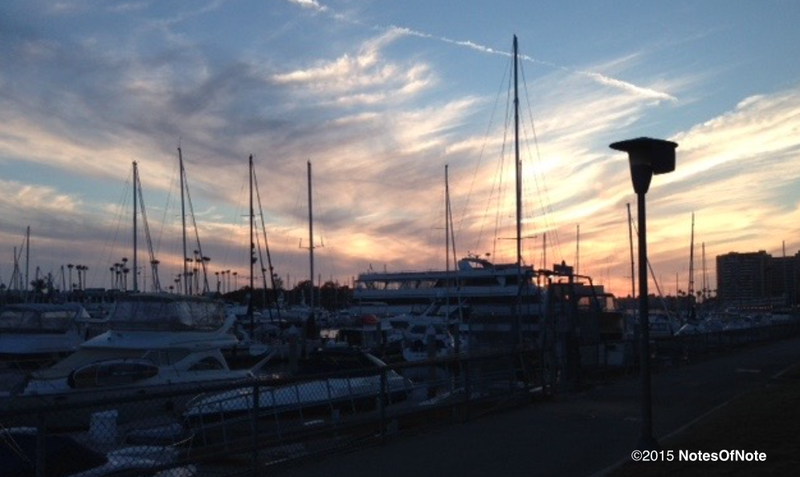 That’s the California Yacht Club over which the day’s dying light appears. 2012 Pannunzio GV Giovanni Vincenzo Malbec, Mendoza, Argentina. Enjoyed the wine–perhaps for the ambiance, perhaps for its red ruby color and balanced taste–and a better end to the work day. At least once previously I’ve been treated with this wine of the three winds – the Polar, Zonda, and Sudestada – courtesy of the God of Winds Eolo. I’m achy all over, tired, and am going to cheat just a little, offering you this link to Notes‘ previous tasting notes rather than coming up with a new profile for you this evening. Hopefully you’ve read enough of this column to forgive my brevity tonight–you know I’ll make it up with some interesting nuggets in the future. 2013 Trivento Malbec Reserve, Mendoza, Argentina. It’s a weeknight and football is on in the background. Finished this red with a grilled New York strip steak, a mixed green salad, and some yellow beans. Some good portion control all around means I enjoyed the inky, red goodness of the Malbec–its mouthfeel, its plum taste–and might even have room for dessert. Hoping you are readying for a good weekend and good beverages too.